Where's My Dam*ed River? Oh, Excuse Me, Where's the River Dam? There's supposed to be a river here. Right there flowing under the bridge where I was standing. And not a little river, it's supposed to be the Tuolumne River, the big watercourse that drains most of Yosemite National Park and provides much of the water used in the Bay Area and in Central Valley irrigation. The construction company that is performing the removal work needed to divert the river for the duration of the project, so they constructed a temporary levee on the north side of the river. The river is at an extremely low level due of course to the season, and the locking up of water in Don Pedro Reservoir many miles upstream. The picture below shows the water returning to the normal channel. There is an interesting phenomena visible at the moment for those who have ever had trouble visualizing the idea of a groundwater table. The river flows over unconsolidated sediments, so much of the river water is actually underground. Damming and diverting the visible flow of the river does not block the movement of groundwater, so as the construction company digs away at the foundations of the dam, groundwater is constantly seeping through to the surface and ponding in the excavation. The company of course knew this would happen so they installed pumps and hoses on the site to put the water back in the river. The flow of the groundwater was rather robust, as can be seen below. The dam removal should be complete in a few weeks (I'm sure I'll find time to do some kind of update), and the Tuolumne River will be changed, not just here, but for some thirty miles upstream. One of the most damaging aspects of the old dam (beside the fact that it killed a number of people) is that it constricted the flow of the river at a critical spot where young salmon were forced into a narrow channel where predators could pick them off easily. With the constriction gone, more salmon may survive, and that should lead to a cascade of positive environmental changes on the river. Actually, I can reverse-predict earthquakes. I can state unequivocally that no more big earthquakes are going to happen in the near future. 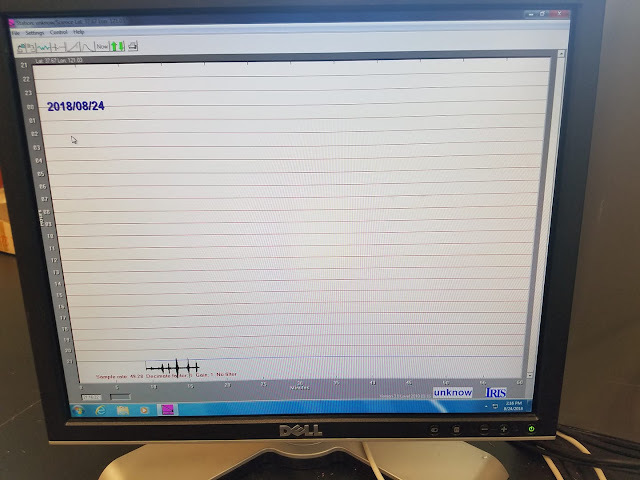 Here's how I can say this: I have a seismometer in the department at Modesto Junior College. It's on all the time, and it will usually pick up magnitude 6 quakes from anywhere in the world, and pretty much any magnitude 4 quake around California. So when reports started coming in from around the planet that we had experienced a couple of large earthquakes, I was anxious to see what the records looked like on our unit. I got to school yesterday and found that there had been a power outage, and I got nothing. No records at all. So I turned the unit back on and that's why I know the big quakes will stop. Now that the seismometer is operating within parameters, nothing is sure to happen. You all seem skeptical! You think this doesn't work? It doesn't seem scientific? Well, I guess you are right. 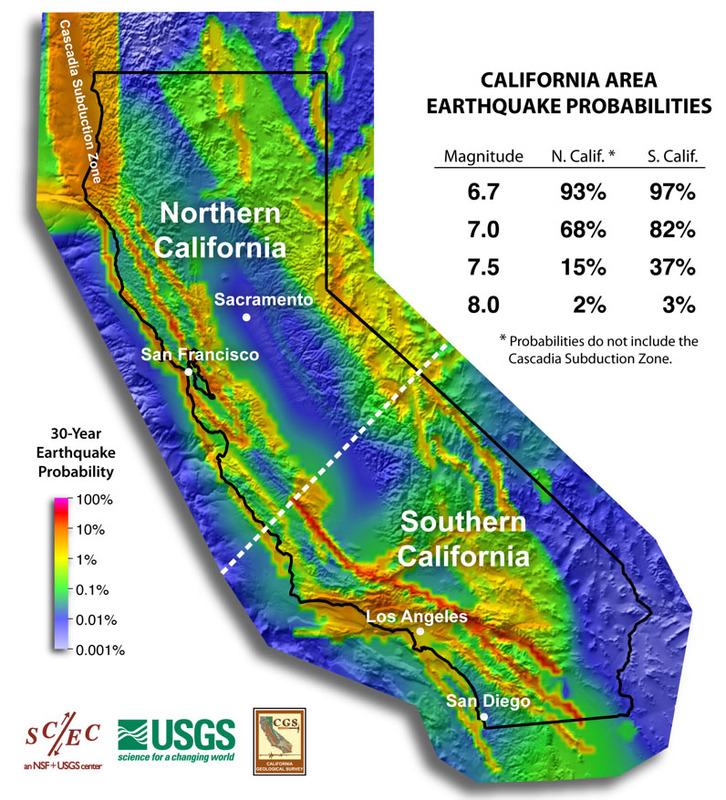 But it IS at least as scientific as the irresponsible scribes across the media who have suddenly spawned dozens if not hundreds of articles noting the clustering of earthquake events and suggesting that California must be next. The BIG ONE IS COMING, they say. These stories are uninformed, and they do a lot of damage of the "Boy Who Cried Wolf" nature. People are perfectly willing to use click-bait titles to get attention (heck, even I did just now, but I'm not selling anything). And they spread a great deal of misinformation, leaving people vulnerable and unprepared for when the big earthquakes actually happen. So here is my brief message about infallibly predicting earthquakes: it can't be done, and anyone on the web who says they can is deceiving you. 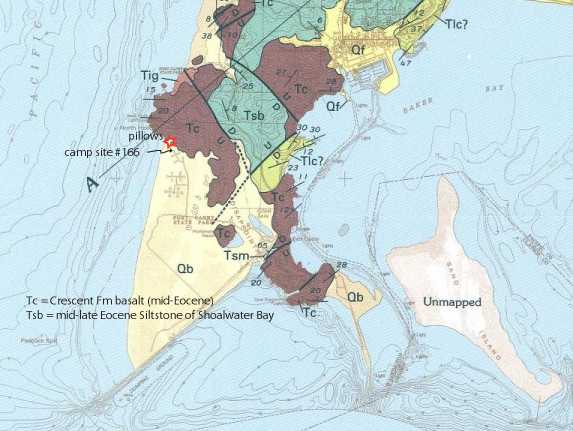 The best we can do is invest in the study of the active faults in our region, and develop probabilities like those seen on the map below. 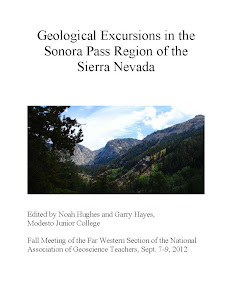 Trust the seismologists and geologists, and learn to think critically about earthquakes. And when you see otherwise responsible news media getting the story wrong, do your part to inform the reporters and news readers. Do you want to learn more? There are lots of reliable places to look. Start with the U.S. Geological Survey, the California Geological Survey, the Southern California Earthquake Center, and the UC Berkeley Seismological Laboratory. I am a mountain person. I'm a desert person. I like being in places where I can see vast distances, where I can navigate by prominent landmarks. I'm often spooked by dense forest environments where I can see only a few yards through the gloom and can't navigate well. I'm talking about map and compass orienteering, but I think a thick forest could disrupt GPS signals too. And what happens if the batteries go dead? Just the same, when it came to choosing a vacation destination this summer, we headed to the northwest, and ultimately found ourselves camping in the Hoh Rainforest of Olympic National Park in Washington. In a summer of record-breaking heat, it was nice to find a cool and shady place. It was blissful. The park was born out of controversy. The Olympic Peninsula is a mountainous landscape that captures vast amounts of precipitation from Pacific storms and the western side of the peninsula is especially lush with a temperate rainforest that was a magnet for timber interests. The huge trees were being harvested at a furious rate, and as the loggers worked their way farther into the interior, people became concerned about the wholesale destruction of the unique environment. Grover Cleveland established an Olympic Forest Reserve in 1897, and Theodore Roosevelt upgraded the status to a national monument in 1909. Congress acted in 1938 to designate the forest as a Olympic National Park. There is always a conflict between those who wish to make short-term profits versus those who recognize the need to preserve intact ecosystems with more intangible values such as clean air and water, wildlife diversity, education, recreation, and national pride. We were lucky in our timing. We traveled in the middle of July instead of August. I was watching reports this week of a dense blanket of smoke from hundreds of fires in British Columbia covering the Pacific Northwest. And of course we haven't been spared here in California. We've had another horrific year of gigantic wildfires that have affected hundreds of thousands of acres, and we had weeks of smoky conditions related to the Ferguson Fire, the Donnell Fire, and dozens of others. There have also been firestorms of political controversy swirling about these fires. Biologic and climate systems are complex, of course, but there are also some fundamental clear truths: the climate is getting warmer, and wildfires are getting worse. We are living the changes that were predicted thirty or more years ago by climate scientists, and the time we have for confronting the problems associated with warming is limited. 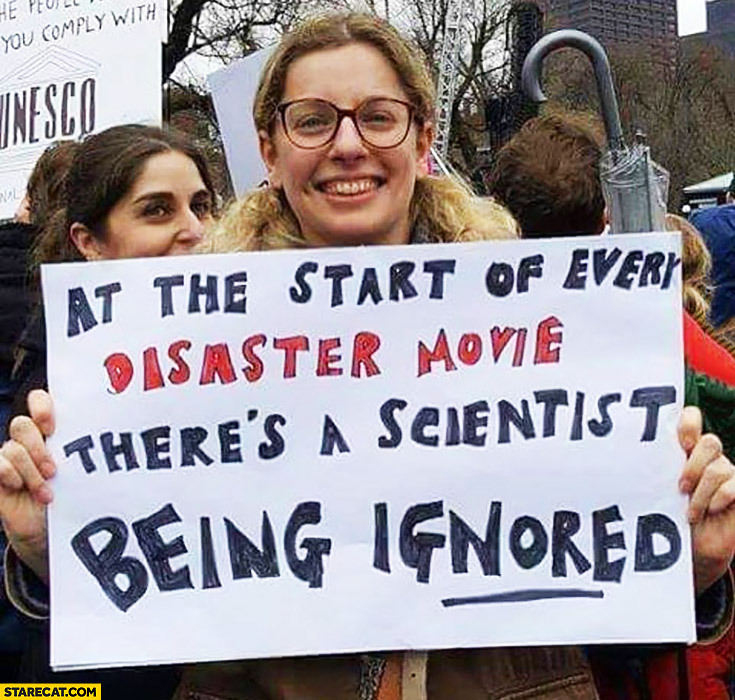 Unfortunately we also live in a time when politicians are in charge who deny climate change despite the overwhelming evidence that proves it is happening. The president says that climate change is not a factor in forest fires, that this is a "management situation", and that we need to "beautifully" remove fallen trees. Secretary of the Interior Zinke says we "have been held hostage by these environmental terrorist groups...that have refused to allow harvest of timber". These statements are highly misleading at best and display ignorance of the science. Forests have been mismanaged. For more than a century a misunderstanding of how fire interacts with a forest environment has meant that fire suppression at all costs was the method of choice. This has indeed allowed overgrowth of young trees and a buildup of fuel on the forest floors. It is a problem though that has been exacerbated by the effects of drought and warming temperatures. There are good ways of dealing with forests on public lands, and there are poor choices that allow a few to profit to the detriment of the rest of us. Clearing out fuel is needed given the new environmental regime that we now live in, but the best approaches will involve prescribed fires that burn out the undergrowth and allow mature trees to thrive, along with other more innovative approaches. Timber companies will say they can clear out the forests, but they invariably favor the big mature trees (that can better survive wildfires), or clear-cut the slopes and replant a single species of tree. This is tree-farming, not forest management. There are big changes coming in our beautiful forests, and a lot of them are not good. The last thing we need to be doing is letting a few people profit, leaving the forests in worse shape than they are now. Denying climate change is simply a pretext to allow a few people to profit from a resource that belongs to all of us. That wasn't on my mind last month, though. I was instead reveling in the coolness and quiet of the trail we were following. It was late in the afternoon and we had the forest to ourselves (aside from a few deer and a smattering of birds...and a gross slug). 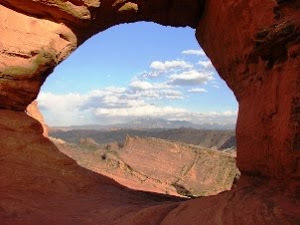 It was a blessing to experience the living example of a great idea: to preserve parts of the primeval landscapes of our country for the good of all. There are lots of mystery spots in the world. My garage is one of them. Over the decades it has collected the flotsam and jetsam of our lives, and it hasn't happened in any kind of organized manner. The last few weeks of this summer has seen one of our most ambitious attempts yet to clear out the debris and preserve the important records of our lives. I even had a yard sale! There have been lots of precious little discoveries, and one of them was the snapshot above, of another mystery spot in the world. It was taken in 1983 or 1984 when I was attending grad school at the University of Nevada, Reno. 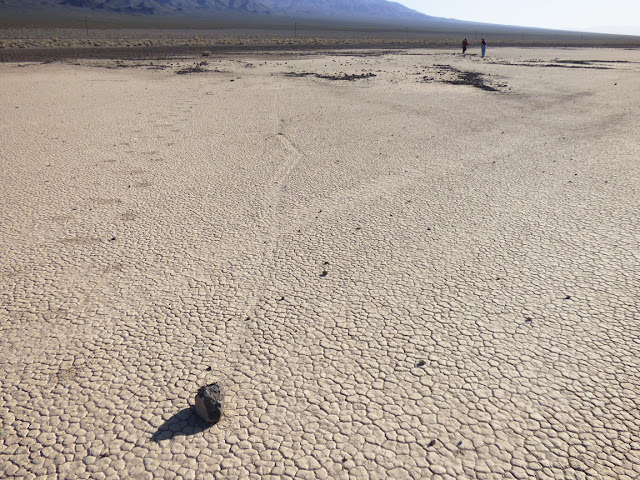 I know that for some of you, seeing the tracks across the playa surface can only mean one place on the planet: Racetrack Playa in Death Valley National Park. For years and years geologists and others noted the strange trackways made by pebbles and boulders and pondered how in the world they happened. There have been the "boring" scientific hypotheses involving wind, water and ice, and the more exotic fringe ideas like weird magnetic currents and aliens. 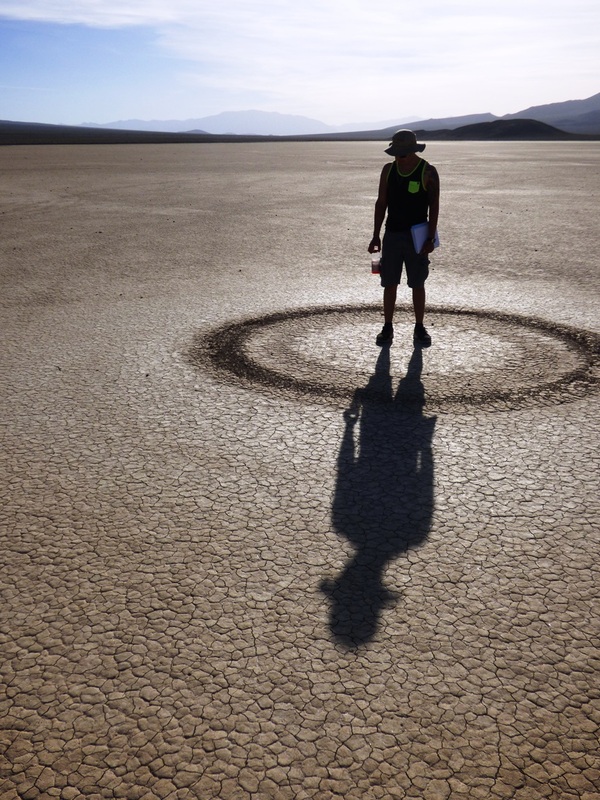 I took the picture, but I've never been to Racetrack Playa and therefore am not guilty of tampering with the stones (the National Park Service and geologists take a very dim view of such things). It turns out the strange sliding stones have been found in other places. I know of at least three of them. Paul is going to solve the mystery of Bonnie Claire Playa, no matter the cost. There seem to be at least three important factors to get sliding stones: a flat playa surface, a nearby source of rocks, and the possibility of freezing windy conditions. The Racetrack has the Grandstand, an island of rock in the midst of the playa and a high enough altitude to get freezing conditions once in awhile. Bonnie Claire Playa in the vicinity of Death Valley has an active alluvial fan and similar elevation. And Highway 50 in the Carson Sink of Nevada has Highway 50. The highway has to cross the playa and to prevent flooding it has been built on a roadway of stones brought in from elsewhere. That's where I was when I snapped the opening picture of this post. Some of the stones escaped from the highway and set off across the playa surface. 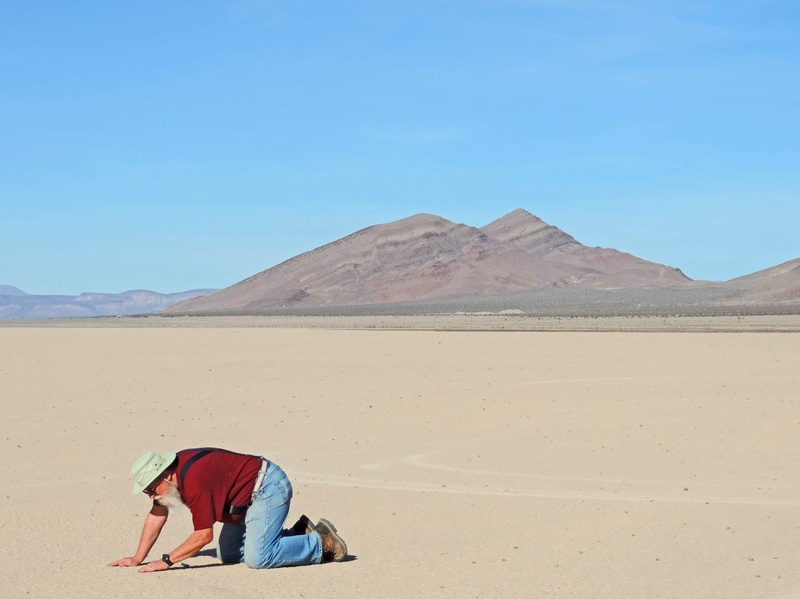 My fellow students were trying to suggest an origin of the trackways as being the result of high winds and too many drunk geologists being blown across the dry lake surface. Some hypotheses involved only extreme winds blowing over a very slick muddy playa surface. Some experiments suggested that pebbles could be set in motion by hurricane force winds, but wind by itself cannot explain the fact that some of the moving stones weigh hundreds of pounds. The fact that some rock trails run parallel to each other suggest that they were locked together. A sheet of ice covering the playa provides a possible explanation. It the ice were to break up into smaller sheets, the ice could presumably act as a sail. Most observers figured that high winds were still a necessity. In 2013 cameras caught the movement of the stones (see it here). Ice was indeed involved, but hurricane force winds weren't required. The sheets of ice were pushing the rocks around in winds as little as 10 miles per hour. It's not clear if this process can explain the movement of the larger boulders. The greatest irony of the mystery of the sliding stones is that they might soon no longer move at all. As the climate changes and warms over the coming decades, the required conditions, particularly that of ice formation, will no longer exist. I was thinking and planning my next post on our recent trip to the Pacific Northwest, but was getting writer's block. 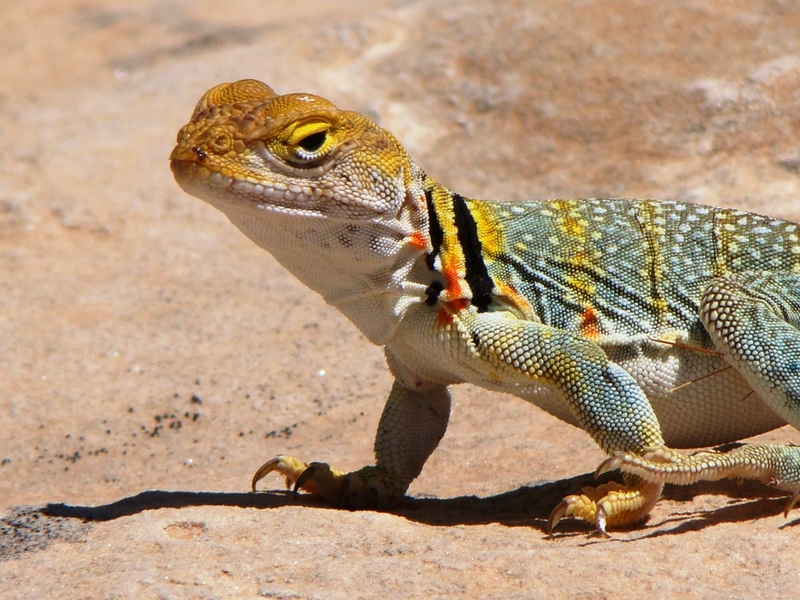 I caught a post from the Ash Meadows National Wildlife Refuge that today was World Lizard Day. I don't know how such things are determined (there is also a Collect Rocks Day), but it was enough to make me look for the best picture I could remember taking of a lizard. It was a Collared Lizard (Crotaphytus collaris) that I saw during a field trip stop at Canyon of the Ancients National Monument in southwest Colorado. Lizards evolved in late Permian or Triassic Time (~250 million years ago). They were part of the dinosaurian ecosystem, but they are not closely related to dinosaurs having split off from more primitive reptiles before the dinosaurs evolved. In a sense birds are closer relatives to the dinosaurs than lizards are, given that birds directly evolved from a group (the theropods) within the dinosaur clade. There are about 6,000 species of lizard in the world today, and they occupy habitats from tropical rainforests to the tundra. Just over 200 years ago, the first expedition of Americans reached the Pacific Ocean after following the Missouri River over the Rocky Mountains and down the Columbia River. Lewis and Clark and their crew arrived in November of 1805, and they knew they could not make the return trip until the winter snows abated. They explored the area around the mouth of the Columbia for an decent campsite to stay in several months. 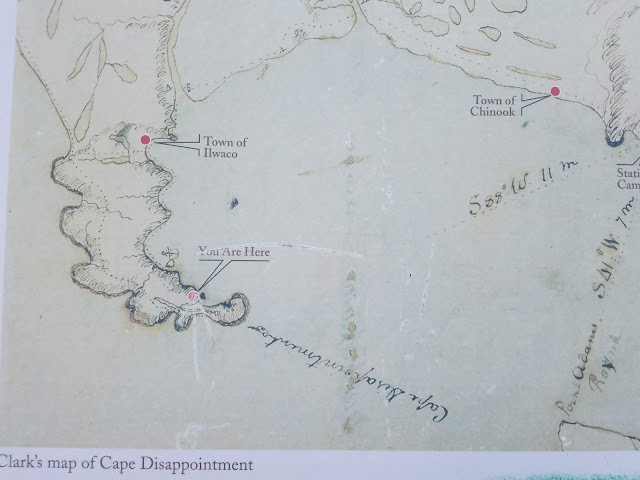 They ultimately settled on the south side of the river at Fort Clatsop, but for a time they spent a week at "that dismal little nitch" on the north side of the river. They explored around the rocky peninsula that had already been given the name Cape Disappointment by fur trader John Meares who, because of a storm, turned his ship around in 1788, just missing the mouth of the Columbia. The credited discovery was four years later, although we know that history has a serious bias; the river was discovered more than 10,000 years ago by humans. The peninsula is today a state park, and it has a well-developed campground complex that fronts a wide sandy beach, with a more modest sandy cove on the east side called Waikiki Beach (it memorializes a Hawaiian seaman who perished during a shipwreck). The mouth of the Columbia River is a nightmare for shipping. 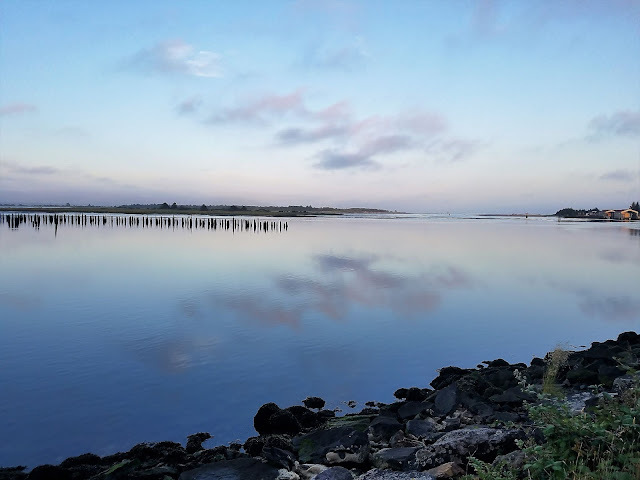 The discharge is more than enough to support even large freighters as far upstream as Portland, but the river carries vast amounts of sand and silt, and the shifting bars have caused vast numbers of shipwrecks. In an effort to stabilize the shifting sand bars, jetties were constructed in 1886. One extends for several miles from Cape Disappointment. Although the rock wall helps to keep the river channel clear, it also serves as a barrier to the southward movement of sand along the coast north of the Cape. The sand started backing up immediately forming the wide flat beaches that can be explored today (see the map below...sand is the yellow unit marked "Qb"). One of the coolest things about exploring Cape Disappointment is the privilege to actually see the rocks. The wave-carved cliffs are not totally covered by vegetation as is so often the case in western Washington. And the rocks are weird. They are not layered, and instead are marked by strange globular masses of what turns out to be weathered and oxidized orange basalt (we would normally expect basalt to be black like the lava flows in Hawaii). How did they get this way? When basalt erupts underwater, it forms these globs that are about the size of thick down pillows. It looks like toothpaste being squeezed out and then getting pinched off. Although these rocks are on land today, they were once on the bottom of the Pacific Ocean. They formed in eruptions at the mid-ocean ridge on the seafloor. They traveled like a conveyor belt for hundreds of miles (at the stunning rate of several inches a year) and were scraped off and added to the edge of the continent in the subduction zone that forms the western boundary of the North American Plate in Washington and Oregon. These rocks, the Crescent Formation, are Eocene in age (around 40 million years ago). Cape Disappointment is a fascinating place to explore (it's neither dismal or disappointing). Watch the weather, though. Not only for the incessant rain, but for fog. It's said to be the foggiest place in the country which helps explain why the peninsula has not one, but two lighthouses. One does not usually equate the city of Modesto with dams and reservoirs. It's true there is a Modesto Reservoir, but it is fifteen miles east of the city. But there is a dam in the city limits, and it has been a problem and an eyesore for decades. Back in 1933 someone had the bright idea of building a small dam on the Tuolumne River by the 9th Street bridge and constructing a nice park built around boating and swimming. Dennett Dam was built, and it lasted an entire seven years before being mostly destroyed by flooding. The park never materialized, and the remains of the dam lay abandoned. At some point, someone thought it would be a good idea to cut an opening in the dam to allow fish to surmount the structure and swim upstream (the Tuolumne is a salmon river). The unintended consequences mounted. The opening set up unpredictable whirlpools in the river current, and at least three people have been trapped and drowned nearby. 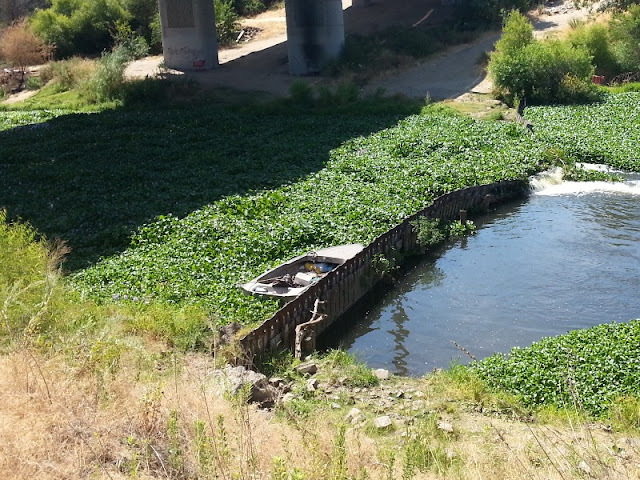 The structure impeded flows of the river and during low water, vast amounts of the invasive weed River Hyacinth would accumulate, blocking the migration of fish, and crowding out native vegetation. And the fish, which the opening was meant to help, were devastated by predators, especially introduced bass. The newly born fish were forced to utilize the narrow opening, and were easy marks for the predator fish waiting in the deep pools beyond. What was to be done? No one wanted to own the dam or be responsible for the problems it was causing. The city of Modesto set aside some funds around 2006, but unexpectedly high costs torpedoed the project. In 2010, the Tuolumne River Trust got involved and began to organizing fundraising efforts, both from individual contributions and grants from the State Lands Commission, California Department of Fish and Wildlife, California Department of Water Resources, USA Fish and Wildlife Service, and local agencies. Ultimately, $1.6 million was raised and work has begun. It's sort of a complicated process. For one, they need to move the river out of the way, so the construction firm (Innovative Construction Solutions) has cut a temporary channel around the dam. It will be filled in when the dam is removed. The deep pools below the dam will need to be filled in. When the project is completed, a major impediment to the migration of salmon will have been removed, and some 37 river miles will become more available for spawning. The land around the dam is slated for park improvement, although much or most of the "development" will consist of rebuilding the riparian habitat that had been disrupted by agricultural and industrial development. The river can become the treasure it has always had the potential to be. If you want to see the progress over the next few weeks (or months? ), it's easy to find. The dam is almost under the 9th Street Bridge in south Modesto. There is a pedestrian sidewalk on the bridge, so just park nearby and walk out. Note: I stole the pun that I used in the title. Years ago my dad was working on a paper that he ended up titling "Damned if you do Dam, Damned if you don't Dam". I've always appreciated it. In our last post, we had a look at the "carpeted" dunes of Florence, the ridges of wind-blown sand along the coast that have been "stabilized" by invasive European Beach Grass. The grass was planted in the 1920s and has spread from California to British Columbia. 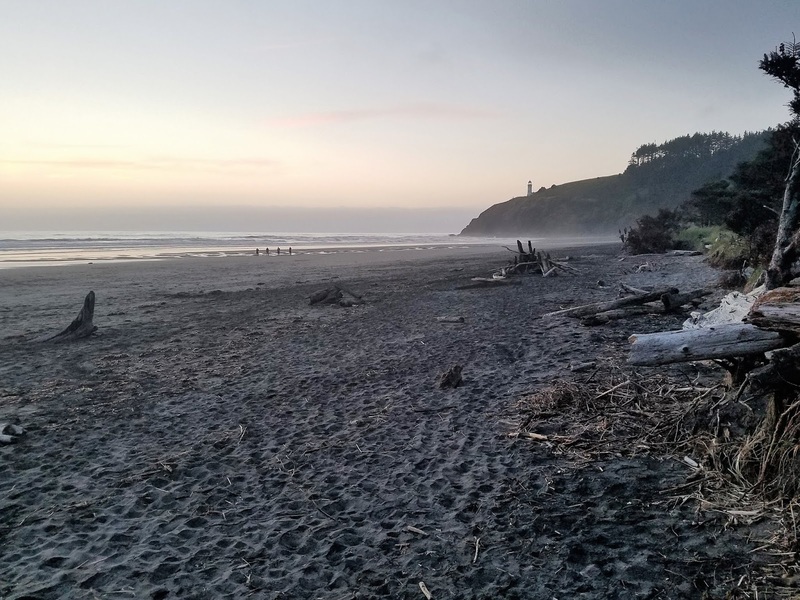 It's a real problem, and huge changes have taken place in the geography of the dune environments along the west coast, especially at Oregon Dunes National Recreation Area. The beach grass has displaced native plants and animals, and caused massive foredunes to rise above the beaches. The inland areas behind the foredunes became starved of sand, forming deflation basins where pools and lakes formed and forests thrived. These are all problems for the original ecosystem of the dunes, but there is the flip side: the stabilization of the dunes was done for a reason. Not all of the dunes in the Florence region are covered by dune grasses. Sand that blew away from the deflation basin formed dunes on the eastern edge of the dune field and many of those dunes have not been covered by beach grasses. The dunes are still active, migrating eastward with the prevailing wind. And that's a problem, at least in some areas. I was at a shopping center in town on a recent trip, and I wasn't having much fun (it was Christmas shopping or some such thing), but I had noticed the dune sands behind the complex and headed out to have a look. The sand ridge was huge and so steep I had to really search to find a spot to climb to the crest. I huffed and puffed my way up and was presented with the awesome view of clean dunes and a distant lake in the deflation basin (the picture at the top of the post). But the crux of the sand problem was the steepness of the dune behind the store complex. It was steeper than the angle of repose (the natural angle of the sand slope). It was immediately obvious that the huge pile of sand was encroaching onto the business complex, and there was a lot of sand. The dune tops were twice as high as the building. There is an ongoing battle to stop or slow the movement of the sand. It looks like they've been bulldozing sand, undercutting and increasing the slope of the dune. It's no doubt an expensive fix, but falling back to the "solution" of the 1920s would be unthinkable today. The movement of sand is unrelenting, and there will always be problems at the back of this business complex.